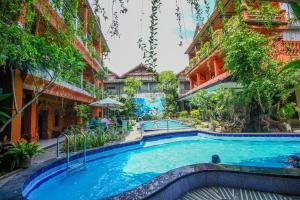 Marinos Place is centrally located in Legian, only 600 metres from the sandy shores of Kuta Beach. Its colourful tropical rooms come with free Wi-Fi and air conditioning. An outdoor pool and Balinese massage are available. Marinos Place is a 5-minute walk from the Ground Zero Monument, as well as many shopping, dining and nightlife options. It is a 5-minute drive from popular Seminyak area and a 20-minute drive from Ngurah Rai International Airport. Spacious rooms are all equipped with a cable/satellite TV. Some rooms have a kitchenette and dining area. En suite bathrooms come with shower facilities. Airport shuttles and laundry services are provided at an extra charge. Free parking spaces are available on site. When would you like to stay at Marinos Place ? This spacious room comes with air conditioning, a cable/satellite TV and a seating area. Bathroom has shower facilities. Each day we'll check prices and send you an email for your selected dates at Marinos Place. If you don't have specific dates but would like to check prices for say next weekend or say next month we can check the price too. Click to write a review and share your experience of Marinos Place with other travellers.